A lizard rescued by Dublin Fire Brigade in recent weeks. LIZARDS ARE THRIVING in the hot weather – but the tiny reptiles native to Ireland are at a particular risk from grass and gorse fires sparked as a result of the warm, dry conditions. You’ll find the viviparous or common lizard in bogland, grassland and coastal areas – and, as they’re cold blooded, they’ve been lapping up all the sun they need in recent weeks. The warm weather and long daylight hours mean lizards can easily reach their optimal temperature of 30-32 degrees without having bask in direct light for hours and leave themselves open to potential risk from attackers. Lizards have been able to do “everything they need to do without having to expose themselves to threats,” Senior Science officer with the Herpetological Society of Ireland Rob Gandola said. Females should be able to produce more offspring as a result of the positive conditions, he added. According to research carried out by Gandola and his fellow herpetologists (reptile experts to you and me) the number of breeding adult lizards in Ireland has been “consistent and stable” in recent years. Fire services around the country have been dealing with a surge in call-outs since the start of the summer – with the Air Corps deployed to respond to blazes in six different counties in the past week. Gandola said that fires represented the biggest current threat to lizards here. There’s “huge burn off this time of year”, he said, meaning the reptiles have less available space to bask, feed and breed. Amongst the lizards population, pregnant females are most at risk from wildfires as they are often less able to respond quickly and move themselves out of harm’s way. 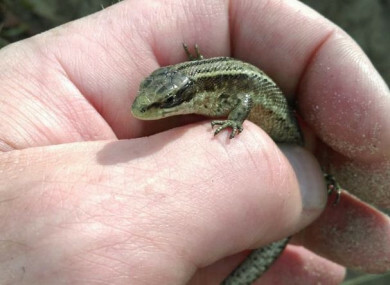 The Herpetological Society of Ireland is engaged in an ongoing monitoring project to keep track of native lizard populations – mainly in the Dublin area. Bull Island, in the north of the bay, is home to a high population of common lizards, Gandola pointed out. This project is part of a wider census being undertaken on the island of Ireland, north and south of the border. Aside from wildfires, lizards in Ireland can also come under threat from increased farming activity, building work and increased contact with humans. Owls and falcons are natural threats, and they are sometimes targeted by domestic pets like cats and dogs. We gathered the first official recording of lizards in the Mourne mountains for @cedarnmni today. Temperature readings, GPS location and photo identifications all taken for future reference. Very very happy with this result. If you keep reptiles in your home, the Herpetological Society of Ireland advises that the temperature of your tank should always be regulated. Checking on your pets and giving them fresh water are key steps in hot weather. Taking out reptiles and putting them in the garden to give them a solid half an hour of natural sunlight will do them “the world of good”, Gandola suggests (although some species should still be kept in a container when outside). As part of its ongoing census project, the society is asking people who spot a lizard in an unusual area to take a photo and get in contact on social media or via email. Email “Irish lizards thriving in the heat, but fires pose a particular danger”. Feedback on “Irish lizards thriving in the heat, but fires pose a particular danger”.